Currently stored in the Reserve Collection. Four SH-2F aircraft served with the Royal New Zealand Navy from 1997 to 2001 as interim aircraft pending the delivery of the new Seasprite SH-2G helicopters. They were operated aboard the frigates HMNZS Te Kaha, Te Mana, and Canterbury, and were maintained by technicians from the RNZAF. 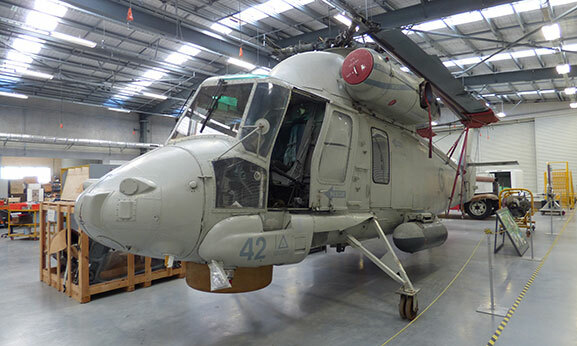 NZ3442 was donated to the Air Force Museum of New Zealand by Kaman Aerospace Corporation. Learn more about the remarkable tale of how Kiwi fighter ace Johnny Checketts’ wartime crash site was rediscovered.